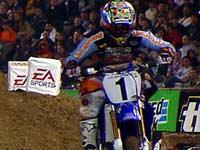 Seven-times AMA 250cc Supercross champion Jeremy McGrath has announced his retirement, sources revealed today. McGrath is currently racing for KTM, and planned to continue for two more seasons, before focussing on the McGrath racing team. His surprise decision ends a career spanning 11 years and 72 wins. McGrath won the 125cc West Championship in 1991 and 1992 before his maiden 250cc victory in 1993. Since 1993 he has won the 250cc championship an astonishing seven times, and has never finished outside the top three. He also won the 250cc AMA National Motocross Championship in 1995, and formed his own team, McGrath Racing in 2001. McGrath has revealed that his riding has been affected by a dislocated hip and a concussion, which have made him lack commitment to racing. As a result he has decided to retire now rather than fade from the frontrunners. No plans have been announced by KTM or McGrath Racing regarding their futures. McGrath has said that replacing himself with a new rider would be difficult, but that the manufacturers are supportive of his decision and both parties are working on a solution. Comment on this story by posting a message on the News board by following the link on the right.